OGLE 2003-BLG-235/MOA 2003-BLG-53 was detected by the OGLE EWS [opens in new window] System on June 22, 2003 and by the MOA group on July 21, 2003. The event resembled the typical single lens light curve [opens in new window] for most of its duration. But for a period of about a week (July 17-21, 2003; HJD 2452835-2452842), the gravitational field of the planet caused the light curve to resemble that of a double star lens [opens in new window]. The precise shape of the light curve reveals that the lighter mass of the double lens has only 0.4% of the mass of the heavier component, which implies that the lighter component must be a planet. OGLE images of OGLE 2003-BLG-235/MOA 2003-BLG-53: 20''×20'' I-band image centered on the source star when it was unmagnified (left) and magnified by a factor of about 7 (right). North is at the top and East to the left. OGLE photometric data of OGLE 2003-BLG-235/MOA 2003-BLG-53 (regularly updated when additional observations of the lens field are collected) are available from the OGLE 2003-BLG-235 EVENT PAGE [opens in new window]. MOA photometric data of OGLE 2003-BLG-235/MOA 2003-BLG-53 are available HERE. Magnification map of the lensing system in OGLE 2003-BLG-235/MOA 2003-BLG-53. Magnification map of the lensing system in OGLE 2003-BLG-235/MOA 2003-BLG-53 (projected on the sky). The dark to bright regions show progressively higher magnifications. The source star moves from left to right along the trajectory shown as the series of dots. Each dot represents a single measurement from either OGLE (red) or MOA (blue). The magnification is locally greatest when the source star crosses the boundary of the caustic region. The definitions of the parameters u0 and φ are shown along with the positions, on the map, of the star and planet components of the lens. 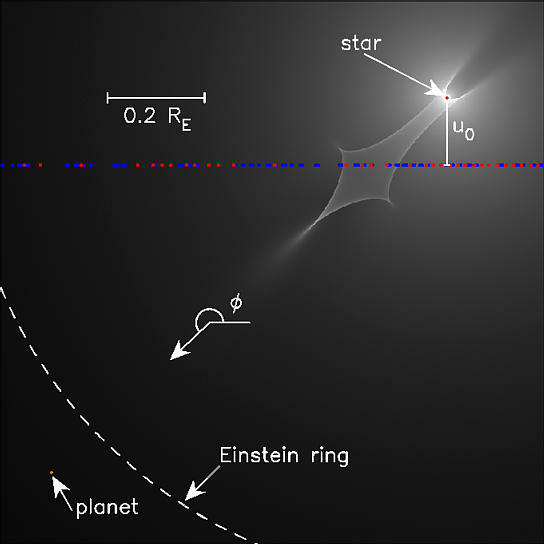 OGLE 2003-BLG-235/MOA 2003-BLG-53: A Planetary Microlensing Event. The paper is also available here in gzipped Postscript or PDF format. Press release on the discovery. This animation is also available in MPEG format (0.5 MB) and AVI format (160 kB). This Figure shows the geometry of a microlensing event in which the almost perfect alignment between a background source star, a lens star, and our observatory allow us to discover a planet that orbits the lens star. Each panel represents a different time in the history of the event, and time can be taken to run from either left to right or right to left depending on the motion of the lens and source stars. 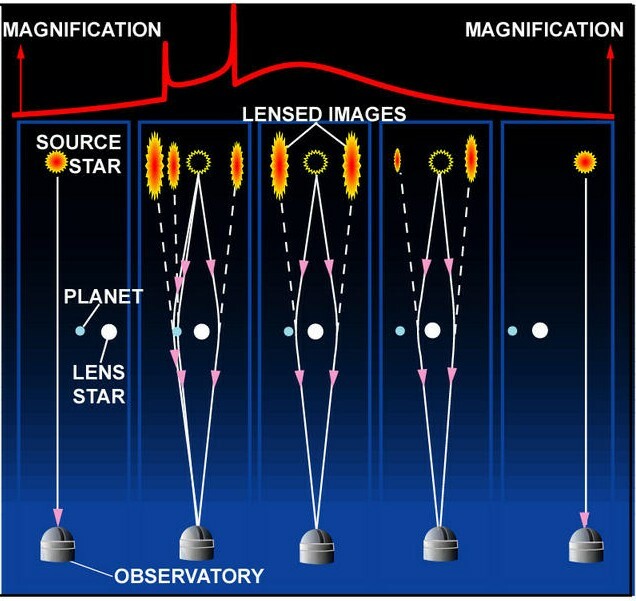 The left and right panels show the usual case in which the alignment is not good enough for the lens star or its planet to affect the light rays that we see. The third and fourth panels (from the left) show the case of lensing by a star: the light rays from the background source star are bent so that two distorted images of star are visible. These images cannot be resolved without a telescope with much sharper images than Hubble Space Telescope, but the overall magnification of the images is visible as an apparent brightening of the source star. The second panel shows the configuration for a planet detection. One of the light rays that is bent by the lens star's gravity comes close enough to the planet that it feels the gravity of the planet, too. This causes additional distortion of the images, and in some cases, additional images can be created which result in dramatic changes in brightness (the spikes seen in the magnification curve). This animation shows the OGLE 2003-BLG-235/MOA 2003-BLG-53 microlensing event in ultra-high angular scale. In the upper panel the position of the lensing star and its planet projected on the sky are marked. The circle presents the Einstein ring which in the case of OGLE 2003-BLG-235/MOA 2003-BLG-53 has the radius of about half milli-arcsecond. Blue dot indicates position of the source star (located in the Galactic center) as it moves during the event. Violet spots show the images of the source star caused by microlensing. Brightness of images is proportional to their area. When the source star moves toward the lensing system two standard images are created by microlensing caused by the lensing star. They move along well known trajectories - one outside and the other inside the Einstein ring. If a planet is located close to any of these images it disturbs them due to additional "planetary" microlensing of one of the standard images. In the case of OGLE 2003-BLG-235/MOA 2003-BLG-53 additional "planetary" images are created leading to the deviation from the typical single star microlensing event. The red contour indicates the area which when crossed by the source star (blue dot) produces most prominent planetary deviation in this star-planet configuration. The lower panel shows magnification of the source star during the event, i.e., the total brightness of all microlensing images (as they cannot be resolved by modern astronomical instruments). The change of brightness due to presence of a planet is the highest when the source star crosses the caustic (red contour) and additional "planetary" microlensing images turn on or off. This animation presents more technical details on the OGLE 2003-BLG-235/MOA 2003-BLG-53 microlensing event. The upper panel shows the close-up of the caustic region (left inset) and the planet area (right inset). The X and Y axes are in Einstein ring radius units. The lower panels present the light curve in different time scales.